Before you can start constructing your tree, you need to find the branches and twigs to populate it. This guide will give you advice on how to go about it and where to find the information, together with hints and tips on deciding whether they are "yours", using our internal pages and external links. The first thing to do when you’re starting out is to write down everything you know about your family – names, dates and places of birth, marriages & deaths etc. Ask your relatives for help, especially the older generation, they’re usually a mine of information and stories. Perhaps take a tape recorder along with you to record what they say. Collect together as many old photos, certificates and other family documents you can find. Try to find out the identities of the people in these photos. Once you’ve collected all of this information and drawn up a simple tree linking them all together, you’re now ready to trace your family back further. FTF Guide: How to Store it All gives some ideas from members on how to organise your information. Downloadable Blank Charts Seven different layouts for recording your direct line. Family Tree Templates - More than 100 family tree templates you can download and print for free. Or, download customizable versions for just $4. You may be lucky enough to have enough information to take you back to 1901 and beyond. The 1911 census is the latest one which is available to family researchers in its entirety. You can search the census from the comfort of your computer chair through subscription websites such as Ancestry. Once you have found your known relative, look to see who’s living in the same household – brothers, sisters, parents or even grandparents. Census returns including names, ages and places of birth were taken every 10 years from 1841, so online you have access to 70 years worth of census records. By tracing your family back through the census returns it is possible to take your family back to ancestors born in the 1700’s. Write down all of your new found information. It would also be a good idea to save the census images you have found to a file on your computer. The FTF Guide: The Census will give you information about Census returns and advice for searching them. What you have now is the framework of your family tree. Some of this information may be wrong, perhaps Granny’s memory is failing, or that the information recorded on the census returns is incorrect. To confirm these connections you will need to obtain your ancestor’s birth, marriage and death certificates. These can be obtained online from the General Record Office (GRO) (the General Register Office of Scotland (GROS) in Scotland) or through the local register office where the event was registered. It should cost you around £9.25 per certificate, which can work out quite expensive. However it is essential that you confirm connections this way, otherwise you can end up tracing the wrong ancestors. If you weren’t able to trace your family back to the time of the 1911 census, then you can do this through certificates. Birth, marriage & death certificates in England and Wales are available from 1st July 1837 (and from 1855 in Scotland) when civil registration was first introduced. Parish Registers began in 1538 when Thomas Cromwell, Vicar-General to King Henry VIII, instructed parish clergy to keep registers of baptisms, marriages and burials. Before this date there were no records, except for a few created by monks who recorded these events for prominent families. Only some of these very early records from 1538 survive today, some parishes even chose not to record these events at first, so coverage will vary from parish to parish. The registers were kept in the iron bound parish chest with other parish records, with yearly copies sent to the local bishop (Bishops' Transcripts). In England and Wales you will find Parish Registers, together with the Bishops’ Transcripts, in the relevant county or city record office (CRO). You may be able to look at the original registers for later dates, however it is most unlikely that you will for the earlier ones. Most have been microfilmed and transcribed which you can view at the record office. You may also find transcribed registers in a local library. You can do research online however this should only be used as a guide as it is always preferable to refer to the actual parish registers for accuracy reasons. Sites such as: Ancestry, ScotlandsPeople, Find My Past, Family Relatives, Origins hold details of parish registers. You will find other records on these sites such as the Boyd’s Marriage Index and the Pallot Marriage and Baptism Index. The Church of the Latter Day Saints (LDS) otherwise known as the Mormons, have gathered a vast amount of information which is of interest to family historians. You can view the International Genealogical Index (IGI) on their website, although this is renowned for its inaccuracies. You can look at microfilmed parish registers at one of their Family Record centres. For more information on the LDS go to A Guide to the LDS . You can buy some parish registers on microfiche or CD Rom. These are sold by family history societies and by companies online such as Parish Chest, GENfair, The Parish Register Transcription Society and Anguline Research Archives. Even in Victorian times many people could not read or write and therefore did not know how their name was spelled. Together with regional accents the vicar or registrar had no alternative but to record the name which they had heard spoken. If you are having difficulty finding a given surname, then think of an alternative spelling or how it would sound spoken in a local accent. The online census returns are an excellent resource for family researchers. However to enable them to be searchable they have to be what’s called transcribed. Each sheet of the original handwritten return is recorded onto a computer database by a transcriber and therefore it’s quite understandable that mistakes can be made. For tips on how to search the census returns go to the FTF Guide: The Census. You can imagine what a mammoth task it must have been compiling all of this information on census night. Very often you will find christian names abbreviated, for example Jas for James or Fredk for Frederick. To find more christian name abbreviations go to Common Forename Abbreviations. Today we name our children according to our own personal choice. Our ancestors may have followed naming traditions. To find out more go to Naming Patterns. You must also bear in mind that your ancestors may not be using the name which they were registered with. If they had a first and a second christian name, then they may have been known as their second name. Also they may be recorded under a nickname such as Jack for John or James, or Nancy for Anne, Ann or Hannah. For more information about christian names and surnames go to Finding those names. If you are looking at very old registers written in Latin, you will find Latin names in Catholic Records useful. As soon as you start researching your family you will begin to amass a large amount of information and notes, certificates and other family documents, together with prints of census images, civil registration and parish register entries, and other information which you have found. It’s a good idea fairly early on to decide how you are going to organise and store it all, otherwise you can quite easily end up with an unmanageable paper mountain. By using a software package your information is held in a manageable and easy to access format. At the click of your computer mouse you can view all of the details you hold on a given person in your tree and clearly see their relationships within it. Many packages have excellent graphics enabling you to create professional looking family tree diagrams. You may wish to scan your family photos, these images can then be held in a file on your computer. Some software packages allow you to link these photographs to individuals in your tree. Unfortunately if your hard drive was to fail, as they eventually do, all of your information held in its files will be lost. It is therefore advisable to regularly back up to disc and keep this in a safe place. Most family researchers use a combination of both computer and paper based storage. Whatever system you decide to use is entirely up to you, however make sure that it’s both safe and secure otherwise all of your hard work will be lost. As you research your family you will not only find your direct line ancestors, but also their brothers and sisters as well. The siblings of your grandparents are your great aunts and uncles, and of your great grandparents your great great aunts and uncles, and so on. You may wish to research these branches of your family to discover their descendants who are your cousins. Those who share your grandparents are your first cousins and those who share the same great grandparents as you are your second cousins, and again this continues. The children of your first cousins are your first cousins once removed. Their grandchildren will be your first cousin twice removed and so on. The same will apply to your second, third etc. cousins. Most family tree software packages will work out these relationships for you. To read more, go to Degrees of Kinship. A list of Forbidden Marriages was drawn up by the Church in 1560 and these rules applied right up until the 20th century when various Acts of Parliament provided more flexibility. As you start to research the branches of your family you will no doubt find cousins marrying, which was acceptable. This was particularly common in close knit communities. You may also find incidences of marriages on the forbidden list. These may not have been blood relationships such as brother and sister, but say of a man and his wife’s niece. It was common for them to go to another county to marry and return as man and wife to the same community, with nothing more said. It does appear that the church chose to turn a blind eye in these incidences. 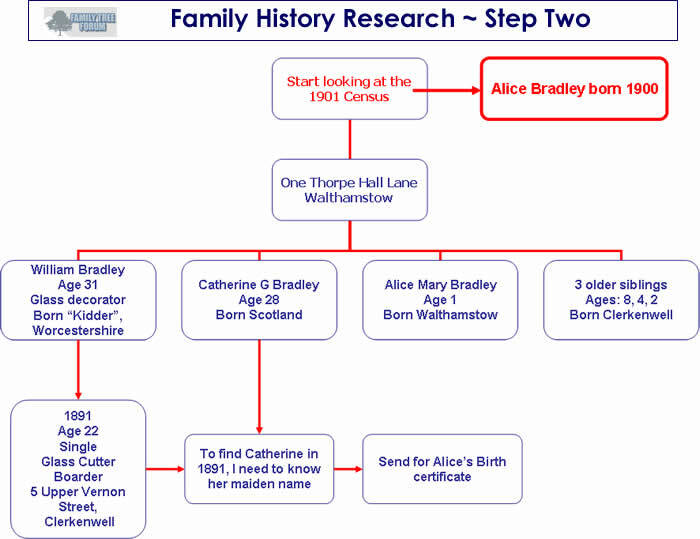 When you discover these multiple connections within your tree you’ll be glad that you invested in a family tree software package to make sense of it all! What you have discovered so far are the bare facts about your ancestors, so if you would like to understand more about their lives then you will need to take your research further. Firstly, you now know where your ancestors were born and where they lived. Perhaps they originated abroad, emigrated or spent some time in their lives living overseas. The World Index and UK County Index have links to many websites both in the UK and abroad which will assist in your research. You may also be able to identify where they lived from the websites listed on Maps and Photographs. Maps and photographs relating to specific areas and locations can be found on the relevant county or national pages. You also know what your ancestor’s occupation was. Occupations and other terms you may come across in your research, together with their meanings, are listed on the FTF Big Book of Genealogy . Our General History Section has lots of links to many websites relating to specific occupations, together with other topics which you may come across in your research, such as finding ancestors who fought in the two World Wars. Our ancestors (like us) were shaped by the world they lived in and the sudden movement of a family, for example, from their birthplace to another part of the country could be explained by what was happening in the wider world. The Timeline will help you to put the personal life of your ancestors in context with the social and political situation of the time. To get some idea of how your ancestors lived you could visit many museums and other sites. Some recommendations and ideas for places to visit can be found on See How Your Ancestors Lived . The page Family History Books has recommendations of books which you may find interesting in putting your ancestors into historical context. The FTF Costume Gallery and Costume Past and Present will give you some idea of the fashions of their time. If you discover a sailor, airman or soldier in your tree, you will find our FTF Guide: Military and Maritime History very handy. As you uncover your family’s history you may well discover cases of Divorce and Annulments, Illegitimacy, Stillbirth or Adoption. These sections of our Reference Library can assist you further in your research. It does need to be remembered that Genealogy is not a purely computer based hobby. So much more information is held in record offices and other archives, such as in The National Archives of the United Kingdom in Kew in London. You can find out what’s held there on their website, The National Archives. Some of the information held at other archives is available on A2A - Access to Archives. Lastly, don’t forget to use your search engine e.g. Google. Search under your ancestor’s names and where they lived. You’ll never know what you may find. 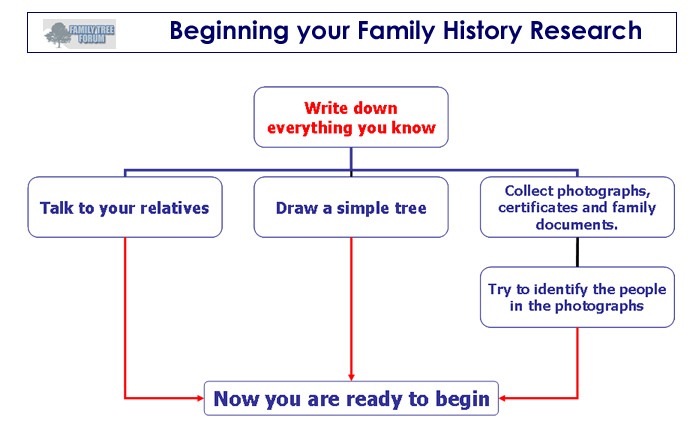 Genealogy is an increasingly popular hobby thanks mainly to the numerous television programmes on the subject. It is possible that other people are researching the same ancestors as you, so it’s a good idea to make contact with them to share information, certificates and even photographs. You will be amazed to see how much family resemblance you can see in a photograph of a distant relative. Perhaps your new found contact may be able to name the unidentified people in your photographs. The Surname Directory lists the surnames and their localities, which members of this site are researching. You can also upload a GEDCOM of your family tree to this site’s GEDCOM Database and search to see if other members are researching the same individuals as you. Other sites you can use for making contacts are Genes Reunited, Lost Cousins, Curious Fox and Genealogists' Forum. One word of advice though. Don’t take the information received from others at face value. You do not know how thorough they have been in their research. Therefore it is advisable to confirm this information yourself before you put it all onto your tree. As well as using the forums for making contact with potential relatives, there are more and more blogs, Facebook pages and Twitter feeds coming online all the time which can give you ideas of other places to look for information. Using DNA testing is becoming more and more popular for potential genealogical matches as the prices have come down. The following site has gathered together a comprehensive collection of links and resources which will tell you all you need to know! Everybody researching their family gets stuck at some point, it’s commonly known as a brick wall. If this happens to you, then just post a thread up onto the Research Board on this site and there should be a helpful member around willing to offer their assistance. If you have a photograph which you require dating or advice on, then you can post this in a thread on the Family Tree Photos board on this site. Your tree is looking good now, perhaps it’s time to revisit your relatives to jog some memories and hopefully get some more information and put some more names to faces in those old photos.